This post is Part 4 of a series to augment the Atlas of the Known World available for free download. Start with Part 1 here. Eternal sands of the mystic Dua Dara. You voted The Sutek Desert winner of August 2014 by 59%. 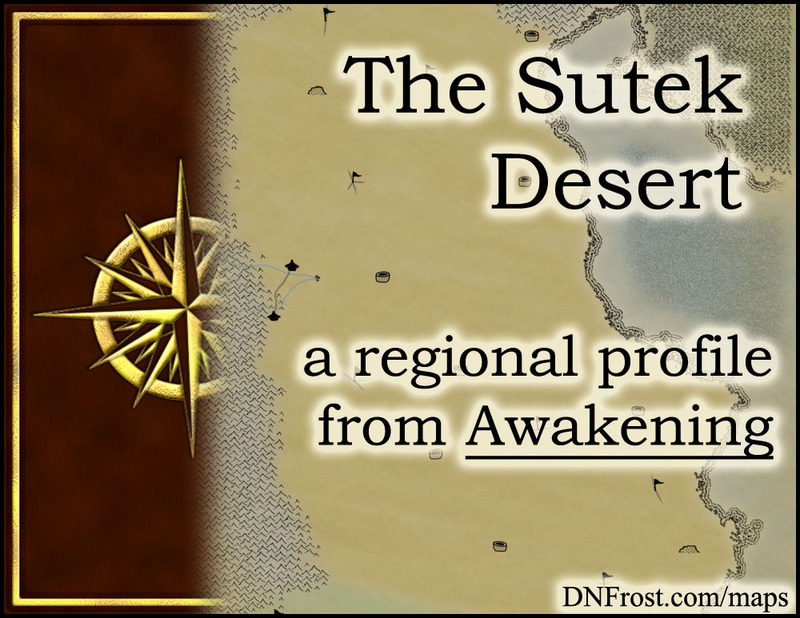 In Chapter 2 of Awakening, the reddish sands of the Sutek stretch from the back of the D'jed Mountains to Allana's east coast. There, the elevation sheers into steep cliffs and escarpments. To the south, dunes spill out into the neighboring plains, while in the north, desert highlands sprout rocky buttes from coarser sands. Few clouds pass the D'jed to rain on the Sutek, so water is pulled from wells and the rare oasis. Arid summers scorch the lapsing breeze, until winter's cooling air stirs whirlwinds and raging sandstorms. This region also borders the Katei Ocean and the Back Rishi, of the Plains of Rishi. Desert insects ground a food chain supporting lizards, hares, and jackals, and domestic camels range wide swaths of land to graze on sparse patches of thornbush. Though cacti grace the rockier highlands and a few natural springs bring green to the sands, most of the Sutek's plant life is irrigated by well water. Elusive and skittish across vast distances, herds of wild pegasi roam the deep desert, but their feeding habits remain unobserved. An isolated and private race of men, the Suteki shun the outside world. Tall and bronze, they sport golden eyes and dark hair, typically black with a bluish sheen. Men shear close to their heads, while women prefer hair grown long and wound in topknots. Both genders tie on sandals and wear lightweight robes, white to reflect the desert sun. As children, white ropes cinch their waists, and girls adopt a red rope at first blood. Boys ascending to manhood receive a blue rope, as do women after marriage. The Suteki make poor elemental mages, though on occasion some demonstrate Earth magic talents. Their sensory magics tend to be quite powerful, Flavor magic predominant with Light magic as a strong latent ability. Animal magic is fairly common, fostering a tradition of skilled caravans and herders. Though Suteki eyes are gold with the sight, only Dua Dara mages learn to harness their latent Gift of portent. They remain the only known landfolk with the power to soothsay. Tribes hold prayer and piety as virtues, and view magic talent as a sacred blessing. Water is precious in the Sutek, and the color blue is correlated with holiness, sanctity, and magic. They emphasize independence and respect, particularly for oneself and one's elders. Many family clans comprise a village tribe, and individuals receive varied rank and council status from their clan name. All Suteki bear their names with pride, withholding them only to spite their enemies, and take grave insult to those who would converse with faces covered. They measure age in hazes, and all grow one haze older on the first sandstorm of winter, which marks the new year. Boys reach manhood on their twentieth haze, and announce their chosen occupation on their fifth day as men. The Feast of Haze commemorates this first decision of adulthood, which the tribe encourages no matter how foolhardy. They find that self-discovery and learning experience outweigh the risk of error. As pegasi warriors, the Dua Dara swear to protect the sanctity of the desert from outsiders. To join the sacred mages, a boy with strong animal magic must bond a wild pegasus foal before his fifth haze. The dangerous rite requires him to venture alone into the deep desert and return within three days. Successful boys leave their families for the brotherhood of Dua Daralel, where they master their magics and learn battle tactics and pegasus care. Once young Dua Dara reach their twentieth haze, the high council assigns them to a specific Daralel, which remains their base for border patrols until retirement or reassignment. Though isolated from the Allanic spoken in most of the Known World, the Suteki language is mutually intelligible for the most part, and translation is rarely necessary. Written in a curvaceous script like that of the merfolk, Suteki sounds formal and archaic to an Allanic speaker. Vocabulary and pronunciation differ in places, but both languages derived from a single origin. Similarly, the Dua Dara hand signals used during flight mirror many signs of the gryphon riders from the neighboring plains, suggesting a historical alliance now lost. In the book Awakening, Tirrok was raised as an orphan after he was found in the village well of Jahari as an infant. With no family name to rank him amongst the villagers, he struggled as an outcast despite his adoption by renowned Jokkel the Guardian. Tirrok attempted the Dua Dara entrance rite in his youth, but though he bonded a pegasus foal, he was not inducted into the brotherhood. Now the Feast of Haze looms before him, and he prepares to reveal his scandalous decision to seek his fortune in the outside world.